Crashing in as a 10-tonne metaphor, Michael Bay’s deafening mega-blockbuster sees humanity attacked by a destructive new super-technology. Well, quite. Yawping a stunning new age for digital animation, Hasbro’s 60ft alien robots transform from helicopters and hi-fis in a seamless spectacle of hydraulic crank and whir, as the evil Decepticons battle the heroic Autobots for mankind’s future. Cue the in-built irony: in Bay’s world, moving parts aren’t for the actors. Stretching back to the ‘80s for their Spielbergian boy-saves-world formula, scripters Roberto Orci and Alex Kurtzman tap an old-school vibe kitted out with zany hackers, government agents and Reagan-era politics (“This is way too smart for the Iranians,” muses Secretary of Defence Jon Voight). But despite sinking most of Transformers’ overlong, overwrought 144 minutes into cornball comedy and hokey teen-romance between nerd-cool hero Shia LaBeouf and high-school hottie Megan Fox, Bay’s feelings are purely for the hardware. Tick-boxing racial demographics, his cast here (including Josh Duhamel and Tyrese Gibson as US soldiers in Qatar) are simply props for ILM. And after a giant robot urinates on John Turturro in Transformers’ most ungracious mission statement, Bay at last flips the switch on a finale of breathtaking sustained chaos. Even spun through wrecked choreography and paper-shredder edits, the groundbreaking CG effects are awesome: jets, tanks and trucks swerving, anthropo-morphing and colliding in a demolition derby of missiles, explosions and LA rubble. Joyously wreaking skyscraping carnage as if 9/11 never happened, Bay plays contemporary apocalypse for kicks. His supertoys will last all summer long, but Bay has never learnt what exec producer Spielberg always knew: disconnected from a beating human heart, even the most spectacular havoc always fades like static. Good to see that Megan Smash Fox (Foxy-smash) gets a mention in here. 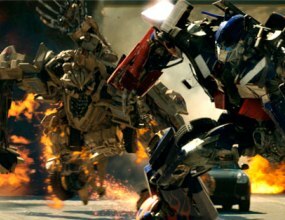 Great article – had a chance to see the latest Transformers movie yet?